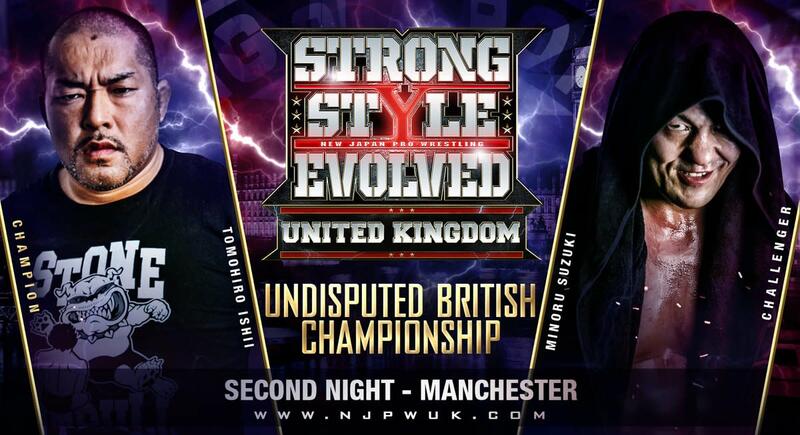 NJPW's Strong Style Evolved UK weekend wrapped up in the Manchester area on Sunday. O-Khan won with Mongolian chops off the middle rope. Oka’s gimmick is some sort of mystical wizard type thing, but people weren’t buying it and kept chanting "genie pants." Nagata submitted him with a crossface. Nagata came off like a total superstar and Umino did really well. They had a comedy/nothing match, ending when Desperado rolled up Gedo. Yano was really over. WALTER hit a powerbomb for the finish. There were lots of stiff chops from both guys, but it was a pretty one-sided match. Taichi picked up the win with a roll-up after Kanemaru interfered. Ospreay was crazy over, but with this being a Taichi match there wasn't much to it. The crowd loved everyone but were really into Tiger Mask. White hit the Blade Runner for the victory. Fletcher was a replacement for Chris Brookes, who was announced as being ill. The match was really good -- the best of the night until the two top matches. The crowd was hot for both guys. Sabre rolled up Okada and pinned him, which amazed everyone. The fans loved Sabre, but Okada was on a different level as a superstar. The audience gave him a standing ovation at the end. I'd put this at 4.5 stars. Amazing match -- I'd go 4.75 stars. Suzuki was the clear favorite and won with a Gotch piledriver. There were standing ovations at multiple points, with the crowd popping huge for the title change. WALTER came out and booted Ishii after the match before having a staredown with Suzuki.